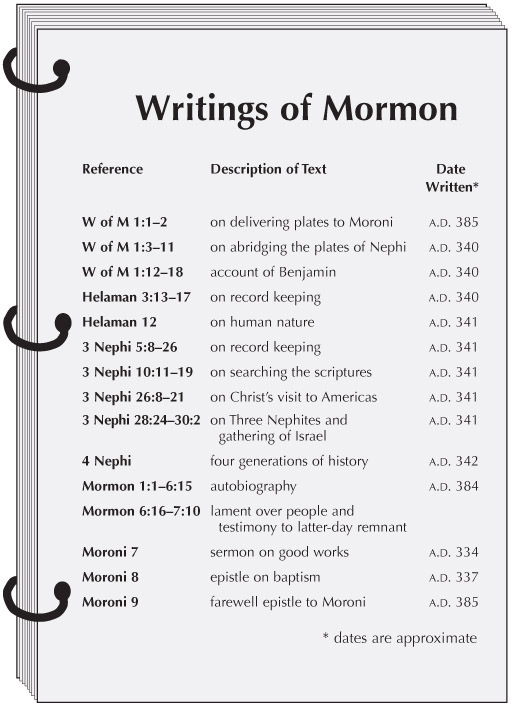 Mormon, the chief abridger and editor of the full Book of Mormon, also added comments of his own to many of the books in that record, besides writing two books within the Book of Mormon that also bear his name (the Words of Mormon and the book of Mormon). As this chart demonstrates, his editorial commentaries, skillfully woven into the text of the primary authors, provide important explanations of human nature, the gathering of Israel, the Book of Mormon in the latter days, and the Savior's visit to the Americas. His own writings include, among other things (not all of which are listed on this chart), an autobiography and important sermons or letters on good works and infant baptism.